The most important thing when contemplating your customized URL is consistency. You want all of your social media channels to be consistent and aligned. For example, all of my social media URLs are “TheWritingGuru” because that is my trademarked brand. One item to consider: if your email is LukePerry1@gmail.com, it may be useful to have a LinkedIn URL that aligns with that as well. I put together this simple infographic that shows you how to easily customize your LinkedIn profile URL in seconds. But, don’t skip out on the additional information below that explains why you should have a customized URL and how it can truly benefit you when networking or job searching in the digital age. Remember, that having a customized URL enables you to effectively grow your network at the touch of a button. Now that you have a customized URL, consider placing your new vanity URL in your email signature block to allow for contacts to easily access your LinkedIn profile. Additionally, leverage your new customized URL to grow your network. Share your new URL with your Facebook contacts and other social media followers to build a stronger network. 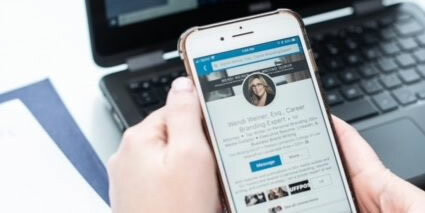 Your LinkedIn URL does not necessarily need to be your first name and your last name. Consider having a vanity URL that’s part of your brand, especially if you have a trademarked name or unique brand. In my case, I use my company name, The Writing Guru for my LinkedIn URL so that no one else can utilize it. Don’t forget to include your customized LinkedIn URL on your business documents (letterheads) as well as your business cards. I hope this proves helpful to you, and please feel free to reach out to me if you have questions.